We like things to be straightforward here at Three Stone Steps. We're about having a thoughtfully curated collection of fairly made and sustainable handicrafts. Although our collection is primarily metal art from Haiti, we do, on occasion, offer goods from elsewhere, including textiles from Central Asia. Simply put: We purchase our goods directly from the artisans who make them at a fair price and sell them to you at an equally fair price. Our collection isn't huge. We feel strongly about being curators rather than aggregators. We only carry items that we'd feel good about displaying in our homes or giving as gifts. We know our collection isn't for everyone. But, if it appeals to you, we're happy to have you along for this journey. And, this brings us to our name. 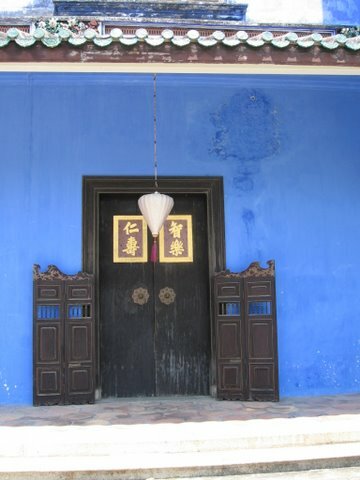 During a tour of the historic Cheong Fatt Zee Mansion, or Blue Mansion, in the Georgetown section of Penang, Malaysia, someone in our small tour group asked why, when all the other steps in a staircase were wood, there were three stone steps on the bottom. The tour guide responded that it stood for solid footing for a good journey. Off went the proverbial light bulb over the head and a name for this little import business was born. An avid traveler, Ellen Reich founded Three Stone Steps to merge her love of travel and her commitment to economic, social, and environmental justice with her keen sense of aesthetics. She also counts herself among the ranks of the former English majors of the world, and even did some graduate studies in English. She did manage to get a masters degree in Labor Studies from UMASS Amherst. She spends most days toiling away at the Three Stone Step worldwide headquarters (i.e. her very Baltimore rowhouse) with her adorable puppy, Harper. In the recent past Fellini and Mingus, all dogs of questionable provenance, were the unofficial mascots of sorts. If you'd like to learn even more, Ellen was interviewed by a The Baltimore Sun business reporter in late 2012. You can read that article here.